When you're a kid candy is a treat. Something given as a reward for a job well done, or on special occasions. But when you hit adulthood, you realize the awful truth : candy is available all the time , to anybody willing to pony up a couple of bucks. So much for that whole Candy Abuse Resistance Education, huh? Sure, I could exercise willpower in preventing myself from downing two entire bags of M&Ms before lunch OR I could pick up a mini Candy Grabber. 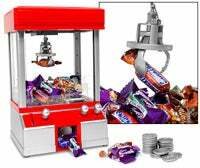 Not only does it store small candy bars (much more friendly to my slim figure), but it locks them inside one of those claw grabber machines that, even at 26 years of age, I still can't manage to beat. Three joysticks control the claw hand and you have a mere 75 seconds to escape with your chocolatey treat. I know at least one person who this could keep entranced for hours . Well worth every pence of the £17.95 (~$34 for us Yanks).